Image caption Police said the bank could have lost "millions"
Twelve men have been arrested over an "audacious" alleged plot to steal millions of pounds from a bank by remotely taking control of a computer. A bogus engineer fitted a device called a keyboard video mouse to a machine in the Surrey Quays branch of Santander, south-east London, which would have enabled a gang to download data. The police arrested the men on suspicion of conspiracy to steal. A spokesman said the "significant" plot could have netted millions of pounds. Santander said a man pretending to be an engineer had tried to fit the device to one of their computers. Several addresses in Hounslow, Brent, Hillingdon, Westminster, Richmond and Slough were searched and property was seized. The arrested men, aged between 23 and 50, were detained in London on Thursday and remain in police custody. The Metropolitan Police said its "time-critical, dynamic response" had thwarted a "very significant and audacious cyber-enabled offence". What is a KVM device? A KVM switch (keyboard video mouse) typically allows a person to control a number of different computers from a distance. Potentially, a hacker using a KVM can switch between different computers, see what is being displayed on the monitors, and control the computers using a remote keyboard and mouse. Police have not said yet whether the Santander KVM was connected to internal systems, to be controlled from another part of Santander, or whether the device was connected to the internet. The force said the operation had helped avoid "multimillion-pound losses" from the branch at the shopping centre. A KVM (keyboard video mouse) device was fitted to a computer within the bank but was not operational, officers said. The device, if operational, would have allowed data and contents of the desktop to be downloaded over the network. Although it is not the first time police have seen the device used, a Met spokesman said it was the first time it had been used by "an organised criminal network". Det Insp Mark Raymond said: "This was a sophisticated plot that could have led to the loss of a very large amount of money from the bank, and is the most significant case of this kind that we have come across. "I would like to thank our partners from the industry who have provided valuable assistance throughout this investigation." A spokesman for the bank said: "Through this co-operation, Santander was aware of the possibility of the attack connected to the arrests. "The attempt to fit the device to the computer in the Surrey Quays Branch was undertaken by a bogus maintenance engineer pretending to be from a third party. "It failed and no money was ever at risk. 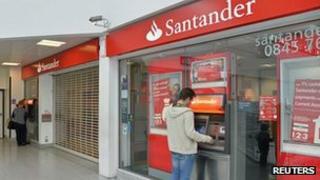 No member of Santander staff was involved in this attempted fraud." A bank spokesman added that Santander was aware it was a target and it had been working with the police for three or four months before the bogus engineer attempted to connect the device. The shutters of the branch in Surrey Quays were down on Friday and several customers were queuing to use the ATMs outside branch to check their accounts.